Newcastle (United Kingdom) (AFP) – South African George Coetzee set about making amends in letting victory slip away last weekend to seize a share of the lead with a seven-under par 63 on Thursday in the British Masters. The 31-year-old capped his round at Close House, Newcastle, sandwiching a sixth hole eagle in between six birdies and just one bogey before being joined atop of the leaderboard by England’s Tyrrell Hatton. Coetzee’s effort is his lowest Tour score in over five years since another 63 on day three of the 2012 South African Open and en route to finishing second. 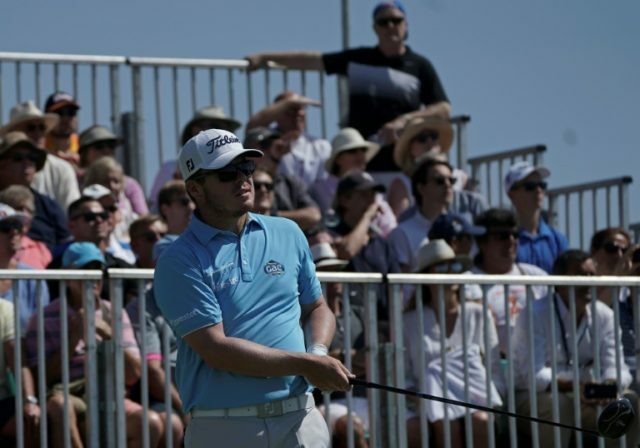 Hatton, 25, birdied five of his closing seven holes and in his first event since finishing third at the recent European Masters. However, both 63s will not be recognised as a tournament course record as a “preferred lie” was in effect due to heavy overnight rain. “I am happy with the score and despite a couple of niggles while I was playing that weren’t that good, had the opportunities when they came, and we were able to post a pretty good number,” Coetzee said. A week ago, Coetzee was just one shot off the lead going to the final hole of the Portugal Masters only to send his drive into water ending with a treble-bogey and slump to a share of seventh. Hatton’s score is timely given he will defend his title at next week’s Links Championship in Scotland. “It was a really good day as I played lovely out there and gave myself plenty of chances, and managed to convert a few at the end,” said Hatton. Five players — Spain’s Alvaro Quiros, England’s Chris Hanson, Sweden’s Rikard Karlberg and the Finnish duo of Mikko Illonen and Millo Korhoren -– share third place in signing for six-under par 64s. Rory McIlroy, and returning to the event where his made his pro debut a decade ago, birdied two of his closing four holes in a three-under par 67. “The course was very soft and receptive,” he said. Tournament host Lee Westwood didn’t drop a shot to be well-placed with a four-under 66 and a score shared by past Ryder Cup colleagues Martin Kaymer, Graeme McDowell and Ian Poulter.